Anyone who knows Kay Umeakunne will vouch for her hard work and tireless efforts as a promoter of chess. Regular readers at The Chess Drum and Georgia Chess magazine know her as 2nd Vice President of the Georgia Chess Association and prolific organizer of scholastic activities. Her most recent success was her M.L. King tournament in January. In addition, she is also a master baker of (now famous) chess cakes. Just when you thought she could do no more, she certainly went to another level with her dedication when she took a flight from Atlanta, Georgia to hand-deliver one of her delicious chess cakes for the Grand Opening of the Susan Polgar Chess Center in New York! She excitedly told me about her experience and decided to write this special article for The Chess Drum. Enjoy!! for the Grand Opening of the Susan Polgar Chess Center"
I usually don't run to catch a ringing phone, but this mid-February day I ran to at least listen to the answering machine as it came on. I could not believe my ears when I heard a voice saying, "this is Susan Polgar from the Polgar Chess Center". 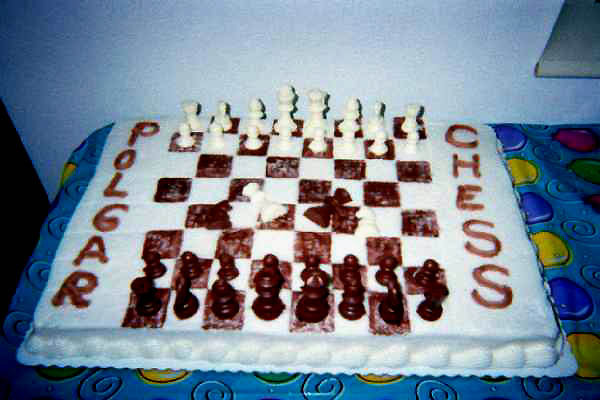 Ms. Polgar said she had seen my Chess Cake ad in the Georgia Chess Association Magazine and wanted to order a chess cake for the grand opening of her Polgar Chess Center in New York on March 8, 2004. I was very honored to receive this order. After much thought about which carrier I was going to trust to deliver the cake in one piece, I decided none of them was good enough and that I would personally deliver the cake to Susan Polgar. I hadn't been to New York in 30 years. When the cab stopped at the Polgar Chess Center, both Susan Polgar and Paul Truong came out to greet me. They were so nice. We displayed the items on the table. New York has some of the most enthusiastic chess people. Everyone was excited at the opening. There was a Chess Master named Demetri who flew all the way from Yugoslavia for the event and gave a speech about the Polgars. The Polgar Chess Center is an attractive facility. The building is well lighted with mirrors on the walls, a large bookstore selection and four rooms for playing. Susan has classes throughout the week, including some for gifted chess students. Others can purchase annual memberships at different levels that provide access to lectures, tournaments, discounts, etc. If you are ever in New York, visit the Polgar Chess Center at 103 Queens Boulevard. It also serves as the training facility for the U.S. Women's Olympiad Team. Susan Polgar funds the center herself and depends on a staff of wonderful volunteers to help run it. This is a center truly worthy of donations. I found Susan Polgar and Paul Truong to be the warmest of people, truly dedicated to the promotion of chess in youth and in girls. Susan autographed an Olympiad calendar for myself and my son Chima, gave me an autographed copy of her book and donated U.S. Women's Olympiad Team calendars for my all girl chess camp to be held here in Atlanta this summer. She will speak to the girls from New York. 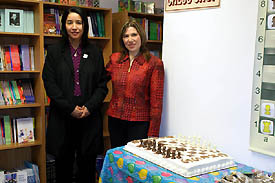 Kay Umeakunne with GM Susan Polgar at the Grand Opening. My trip to New York and the festivities was cut short by my return flight. When I entered the cab Paul Truong obtained for me, the driver said he wanted to learn chess. He also remarked, "You know, this place used to be a Palm Reading business." Well, their last prediction must have been that the future of chess in New York looks bright, especially with Susan Polgar and Paul Truong behind the moves! ChessBase.com, "Queen of the King's Game in Queens," 10 March 2004. The Chess Drum, "GM Polgar visits Dallas' St. Phillips School!" 22 February 2004. The Chess Drum, "Atlanta's M.L. King Tournament a rousing success!" 29 January 2004. The Chess Drum, "Play Your Game and Eat It Too!" 30 July 2003.